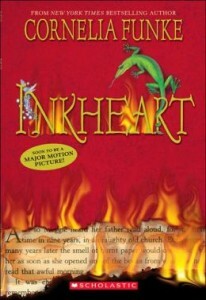 Inkheart is a young adult fantasy novel by Cornelia Funke and the first book in the Inkheart trilogy. The book tells the story of twelve-year old Meggie who lives with her father Mortimer, also called Mo and Silvertongue. When Mo is visited in the middle of the night by a strange visitor named Dustfinger, Meggie finds herself pulled into a world much like the worlds in the pages of her books. When Mo reads aloud, he has the ability to read characters and objects out of the book he is reading. When Meggie was little, he accidentally read a villain named Capricorn out of a story called Inkheart and his wife Teresa into the story. Capricorn is intent on increasing his wealth and power by using Mo’s ability. I wanted to like this book. I really did. The concept was intriguing and extremely though-provoking. A guy with the ability to read characters and objects out of stories? Sign me up, right?! The book was WAY too long. The writing was long-winded—too much description, too many plot deviations. Lack of character development. The characters don’t grow. Ever. This is okay for the minor characters. I mean, I understand if the minor characters are flat characters. The main characters, however, should be round characters. They were not. They all stayed the same. The constant self-glorification of book lovers. We’re book lovers, and we’re awesome! My dad is in danger, so I’m going to rescue him, but I’m going to take along a few of my favorite books to read as I do. As a book lover, this really annoyed me. Apathy toward violence. The violence was just kind of accepted in the novel. No questions asked. Slightly disturbing if you ask me. The ending. Not only because it ended. The ending was actually well-written, but I no longer cared by the time it ended which almost nullified the beauty of the ending. Maybe in the original language the book is different, but in this language, the book left much to be desired. Overall, I give it 2/5 stars. Not reading the sequel.